Soldier who ended Neve Tzuf slaughter by shooting terrorist in stomach may receive citation from IDF. 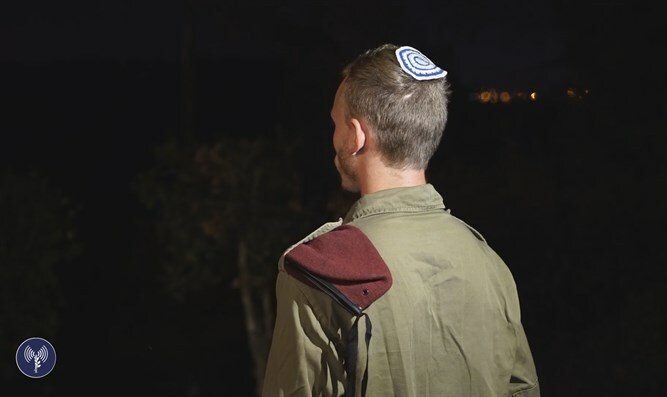 The soldier who neutralized the Neve Tzuf (Halamish) terrorist on Friday night may receive a citation, Hebrew-language newspaper Yediot Aharonot reported Thursday. First Sergeant A. serves in the IDF's Oketz Unit, which is the IDF's canine special forces unit. A., who is 22, was home on leave when he heard screams coming from his neighbor's home on Friday night. Taking his gun from the safe, A. ran outside, climbed over the neighbors' wall, and shot the terrorist in the stomach - right through the window. The terrorist fell through the floor, and the Salomons' daughter-in-law and her five children were spared. Friday's attack was not the first time A. was involved in a security incident in his home town of Neve Tzuf. Three years ago, a terrorist entered A. 's home and attacked his sister. At the time, A. chased the terrorists out and alerted the security forces. In his Saturday account of the incident, A. said, "While my family ate the Friday night meal, we heard screams from the direction of our neighbor's home. My father and I went out to see what was happening... I ran back home to get my weapon." "I stood outside the house and saw the terrorist through the window. I knew that I couldn't lose my cool, I had to be professional and controlled....It seems I was at the right place at the right time. "I try to focus on the fact that what I did prevented what could have been a worse tragedy. But this is not the first time we have experienced something like this."